We are pleased to announce the promotion of one of our own fine caregivers, Devonn McClennon, to the full-time position of Client Care Supervisor! 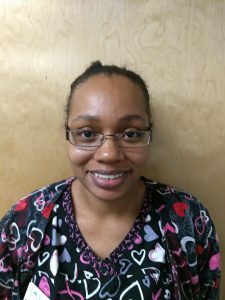 Devonn is an experienced CNA who has worked in the geriatric care community for over 12 years. She was one of the very first caregivers this company hired! Devonn has a ready smile that always brightens up any room, along with a quick wit. Clients love her! She is a highly skilled and knowledgeable nursing assistant. Devonn demonstrates compassion and patience with clients and helps them to not just age in place but flourish, consistent with the company’s mission and core values.. She has proven herself to be reliable and dependable. Devonn expressed from the time we hired her a desire to move up in the company. Devonn also aspires to return to the classroom someday and eventually become a registered nurse! As Client Care Supervisor, Devonn will play an important role in Flourish’s provision of exceptional care to clients. Devonn’s duties will include scheduling caregivers and coordination of client care, under the supervision of the Clinical Director and the Administrator. Devonn also will assist with the orientation of new caregivers, with fostering positive relationships with clients and their families, and with conflict management. In addition, Devonn will serve as a substitute caregiver when regular caregivers are unavailable. Congratulations to Devonn on her well-deserved promotion! If you or an aging loved-one are considering in-home Caregiver Services in Orlando FL, please contact the caring staff at Flourish in Place Home Care Solutions today. Proudly serving Orange, Osceola, Seminole, and Brevard Counties. Call 407-845-9797. This entry was posted in Caregiver Orlando FL, Company News and tagged Caregiver Orlando FL. Bookmark the permalink.